LB Bulgaricum installed AssetClean filling line for milk in PET bottles. A Bulgarian investment in the direction of Ultra Clean filling of fresh milk – INDEX-6 put in exploitation filling line for the new brands of milk of company LB Bulgaricum (in PET bottles 1 and 0,5 liter), made from selected Bulgarian milk, after pasteurization process and preserved all the nutrient properties and without artificial improvers and ingredients. Ultra Clean filling performed in clean environment by our machines with precise dosing. 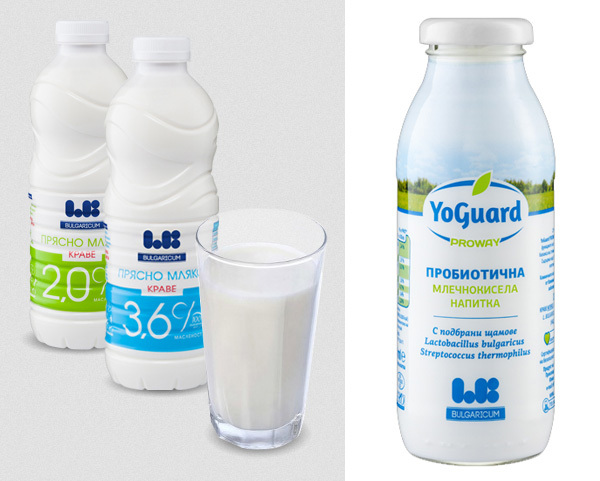 The newest probiotic product of the company is "YoGuard proway" – in glass bottles, without analogue on the Bulgarian market (milk drink with more than 100 million viable cells, made of 100% high quality cow`s milk and symbiotic combination of selected strains Lactobacillus bulgaricus and Streptococcus thermophius). The filling line which serves the products consists of: flowmetric AssetClean filling triblock from the 43 series with sterilization of the bottles and caps with ozonated water; PPS system to ensure high hygiene with the compulsory Hepa filters; CIP and SOP cleaning of the triblock to ensure the shelf life of the fresh milk. The filling line (Asset Clean 43 -16/10/ FFS + IND-Lab 32 B + IND-Lab 38 + IND-Pack 29 + IND-Trans 71) is extremely flexible with the possibility for filling of fresh milk and yogurts, and also combined filling and closing of glass and PET bottles, labeling with self-adhesive label of the glass bottles, and full or partial termoshrinkable sleeve label, as well as group packaging in various configurations.